Getting my children’s books organized has always been a challenge for me. No matter what I do or how involved I get my kids, many of their books end up on the floor or not in the order we created. This past weekend, I simply had enough as I watched a wonderful new book get trampled on by my 4-year-old daughter and her friend. I realized that our lack of book organization had created a lack of respect for books. That realization pushed me to search for the best way to organize my children’s books to learn about ways to keep them organized. Currently, we do not have our bookcases anchored to the wall and before stumbling upon this tip, the thought hadn’t crossed my mind. However, bolting or anchoring bookcases is essential in order to prevent tipping. Please don’t underestimate the importance of this safety precaution, as even a small bookcase can tip and injure a small child. If you aren’t the handy type and cannot do it yourself, ask a handy friend, family member or neighbor to help you out. They’ll surely be willing to assist you if they know it involves protecting your children. There are several successful book organizing methods that sound like they could be highly effective at keeping books organized and encouraging kids to keep it that way. Select the method that works best for your family based on the number of books you own, the ages of your children, the type of books and the type or organizing system or bookshelf that you will use. Before deciding on how you’ll organize the books, select where to organize them. Will it be in each child’s room, in a study, in a playroom, in a hallway or in a den? To help you decide, only consider places that are 100% easily accessible. Make sure the bookcase is not hard to reach or in a corner behind toys. The more accessible the bookcase, the greater chance that your children will put the books away. Place a small step-stool next to the bookcase so that toddlers can reach books on higher shelves. The most obvious way to organize books is on a bookshelf. However, consider some out-of-the-box ideas that may work for your family: canvas book cases, wood cubbies, plastic baskets for small books, or an empty dollhouse. What works for one family may not work for another. If you have many small board-books, a short, two-shelf bookcase would work wonderfully. Place baskets on the lower shelf. Designate each bin with a different category by placing an image on the bin. For example, mark the bins with animals, colors and shapes, numbers and letters and other categories according to your collection. This system works best for older toddlers, and the success of this method will depend upon the age of your children, the number of books and the number of different book categories. If you only have a few board books, keep them in one basket. Alternatively, use two baskets and separate by size. children won’t have access to it. There are two excellent ways to organize bookcase books: according to size and according to category. Organizing according to book size is easy for young children and will make clean-up time a breeze. It also helps the book stand up better than placing several sized books together. Organizing by category is helpful for children ages 6 and older. Go through your books and decide on appropriate categories. Assign a sticker color for each category and place the sticker on the spine of each book. This system works best with thin paperback books that often get overlooked or lost in a pile of unorganized books. 1. Remove seasonal books — such as holiday books — and place them on a high shelf or store away until the holiday approaches. 2. Store books that aren’t age appropriate to pull out later on. 3. Make a book area with bookshelves or put a small bookcase in each child’s room. Divide the books up according to age. Whatever method you select for organizing your books, make sure to get your kids on board with the process. They’ll be more likely to help keep it neat and organized if they had a part in it. 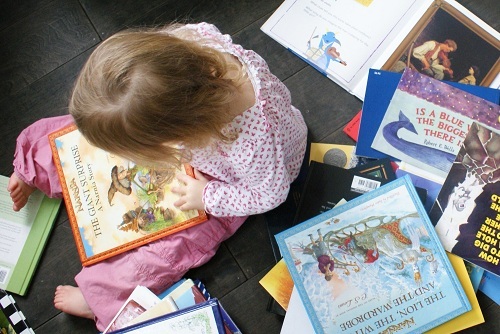 How do you organize children’s books in your home? Marcy Tate is a writer at Networx. Networx provides the latest information on how to fix, renovate, decorate and organize your home using the smallest amount of resources for the best value. Does Your Home Have "White Space"? Question of the Day: What’s Your Best Back-to-School Tip?